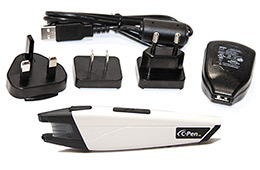 The EC-Pen English <-> French Handheld Translator and scanner is a remarkably affordable and reliable solution for handheld data entry and translation. A unique alternative to fixed desktop scanners, this exclusive pack includes the remarkable EC-Pen and the award-winning LingvoSoft Talking Dictionary and Talking Translator software - providing data capture and translation opportunities you never though possible! By letting you import the exact segment of text you need, EC-Pen saves time and energy and helps avoid the mistakes that come from manual data entry. And by instantly inserting your scanned data into the LingvoSoft Talking Dictionary for individual words and Talking Translator for longer texts including letters and technical documentation - it provides instant translation of any English or French text - no matter where you find it! With their state-of-the-art TTS speech synthesis, LingvoSoft applications even pronounce translations out loud using sophisticated text-to-speech modules. Now you can import information for translation from curved, laminated and patterned surfaces as well as from magazines, books and wall-posters by simply waving the EC-Pen over the desired text. Connecting easily with your laptop or desktop PC, it is lightweight and extremely portable offering instant translation from places you never thought possible. Use it in the library, at the office or even on a plane. Able to recognize printed text in over 167 languages it lets you send English and French words, phrases or paragraphs from books or documents to your PC for translation and pronunciation - helping you understand more and learn faster. The EC-Pen English <-> Italian Handheld Translator and scanner is a remarkably affordable and reliable solution for handheld data entry and translation. A unique alternative to fixed desktop scanners, this exclusive pack includes the remarkable EC-Pen and the award-winning LingvoSoft Talking Dictionary and Talking Translator software - providing data capture and translation opportunities you never though possible! By letting you import the exact segment of text you need, EC-Pen saves time and energy and helps avoid the mistakes that come from manual data entry. And by instantly inserting your scanned data into the LingvoSoft Talking Dictionary for individual words and Talking Translator for longer texts including letters and technical documentation - it provides instant translation of any English or Italian text - no matter where you find it! With their state-of-the-art TTS speech synthesis, LingvoSoft applications even pronounce translations out loud using sophisticated text-to-speech modules. Now you can import information for translation from curved, laminated and patterned surfaces as well as from magazines, books and wall-posters by simply waving the EC-Pen over the desired text. Connecting easily with your laptop or desktop PC, it is lightweight and extremely portable offering instant translation from places you never thought possible. Use it in the library, at the office or even on a plane. Able to recognize printed text in over 167 languages it lets you send English and Italian words, phrases or paragraphs from books or documents to your PC for translation and pronunciation - helping you understand more and learn faster. El escáner y traductor de mano inglés <-> español EC-Pen es una solución increíblemente económica y confiable para la entrada de datos y la traducción portátil. Una alternativa única de los escáneres fijos de escritorio, este exclusivo paquete incluye el EC-Pen y el galardonado Diccionario parlante LingvoSoft y el software de Traductor parlante que ofrece captura de datos y oportunidades de traducción nunca antes concebidas. Al importar el segmento de texto exacto, EC-Pen ahorra tiempo y energía y permite evitar errores que resultan de la entrada manual de datos. Y al insertar de manera instantánea los datos escaneados en el Diccionario parlante LingvoSoft para buscar palabras individuales y en el Traductor parlante para textos más largos, incluyendo cartas y documentación técnica, proporciona al instante la traducción de cualquier texto en inglés o en español, sin importar dónde lo encuentre. Con su sintetizador de voz TTS de avanzada tecnología, las aplicaciones de LingvoSoft pronuncian las traducciones en voz alta por medio de sofisticados módulos de texto a voz. Ahora puede importar información para traducir desde superficies curvas, laminadas y con diseños, y también desde revistas, libros y letreros simplemente pasando el EC-Pen sobre el texto deseado. De fácil conexión con la computadora portátil o con la PC de escritorio, es liviano, sumamente portátil y traduce al instante textos de lugares que antes resultaban imposibles. Úselo en la biblioteca, en la oficina e incluso en el avión. Con la capacidad de reconocer textos impresos en más de 167 idiomas, este dispositivo le permite enviar palabras, frases o párrafos en inglés y español de libros o documentos a su PC para traducirlos y escuchar su pronunciación, con lo que podrá entender más y aprender más rápido. With the C-Pen 3.5 you can scan and load printed text to your computer with no strings attached - literally! The new Bluetooth operated OCR will transmit any text you swipe directly to your computer. Scanning speed has been increased so you can scan as you read and the recognition will be virtually instant. With the Ectaco C-Pen 3.0 you can scan and OCR (Optical Character Recognition) printed text into your computer. A brief sweep with your Ectaco C-Pen and the text instantly appears in any open application on your computer. Easy to use with translation software, text-to-speech applications, internet banking, etc. These applications are NOT included in this package. 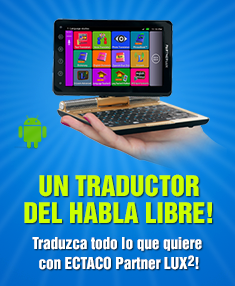 El escáner portatil Ectaco/C-Pen es una herramienta increíblemente conveniente para entrar los datos para su uso a los traductores de la serie iTRAVL, así como a los dispositivos de las series LUX2, 900 y 850.